In light of the current debate on the reception of Communion in the hand, it is helpful to step back and assess the facts from a prudent distance. As with many aspects of current liturgical practice there are no absolute answers. After the Second Vatican Council, the practice of receiving Communion in the hand was adopted and has become virtually universal throughout the Catholic Church (even if some people still receive Communion on the tongue). The actual documents of the Council do not mention the possibility of returning to the original manner of receiving Communion in the hand or receiving Communion standing. However, this does not imply that this is an illegitimate return to ancient practice. Very simply, St. John XXIII (and Blessed Paul VI after him) understood that the Council would provide a theoretical basis for liturgical renewal and the details would be worked out after the Council had finished. Thus the liturgical renewal was clearly inspired by the Council and the renewed liturgy is in clear continuity with Vatican II, in much the same way as the Tridentine liturgy was not prepared at the Council of Trent itself, but was renewed afterwards. The very idea of people regularly receiving Communion (and even receiving Communion as part of the liturgy to the Eucharist itself) were relatively new ideas at the time of the Council. The liturgical renewal of St. Pius X which promoted the frequent reception of Communion were still quite young. For centuries Catholics simply did not receive Communion on a regular basis. Already in the time of the Fathers of the Church, many Catholics had simply stopped receiving Communion at all due to a feeling of unworthiness. In Gaul, too, the Synod of Agde (506) found it necessary to insist on Communion three times a year, on Christmas, Easter, and Pentecost, as a minimum. And this demand was repeated time and time again till the very height of the Middle Ages, sometimes with the addition of Maundy Thursday. In the Carolingian reform the attempt was made to re-introduce Communion every Sunday, especially on the Sundays of Lent, but the result was at best temporary. From the eighth century onward, the actuality seems generally not to have gone beyond what the Lateran Council of 1215 established as a new minimum: Communion at Easter. From a historical point of view, Communion in the hand is the manner that Communion was given to the everybody (laity and ordained) in the early centuries of the Church. After the Council the practice of receiving Communion in the hand became common in certain parishes in Holland, Belgium, France and Germany. Pope Paul VI commissioned a study on the matter and in 1969 suggested that Bishops’ conferences could petition the Holy See for an indult allowing Communion in the hand in their region. During the 1970’s the Bishops’ Conferences of the following English-speaking countries applied for and received the indult: South Africa, Canada, Rhodesia (Zimbabwe), Zambia, New Zealand, Australia, England and Wales, Papua and New Guinea, Ireland, Pakistan, the United States, Scotland, and Malaysia and Singapore. Similar numbers of other bishops’ conferences obtained indults in their own regions so that today it is virtually universal throughout the Church. Cardinal Sarah’s recent intervention is problematic under a number of aspects, many of which have been explored in the original Pray Tell post and in the discussion in the comments section of that post. Here is not the place to repeat this discussion. The pastoral effectiveness of a celebration will be greatly increased if the texts of the readings, the prayers, and the liturgical songs correspond as closely as possible to the needs, spiritual preparation, and culture of those taking part. This is achieved by appropriate use of the wide options described below. From this I take it that John Paul II did not regard the reception of Communion in the hand as being allied to Satan. Regarding Mother Theresa, the original website that published Cardinal Sarah’s introduction has a photograph of Mother Theresa receiving Communion on her tongue. However, there is also photographic evidence that shows Mother Theresa received Communion in the hand. 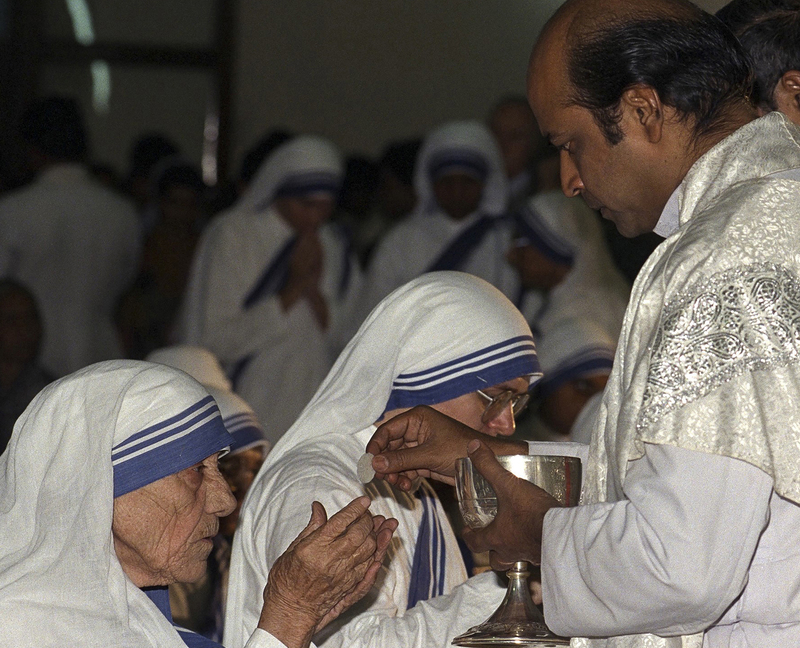 She was photographed receiving Communion on her hand while attending Mass in the chapel of the orphanage she was ministering in in Calcutta in the late 1990’s. The photograph can be found in the beautifully illustrated portrait of Mother Theresa by photojournalist Linda Schaefer. Neil Xavier O’Donoghue is a priest of the Archdiocese of Newark, New Jersey. He currently ministers in the Archdiocese of Armagh, Ireland, where he serves as vice rector at Redemptoris Mater Seminary. He has studied at Seton Hall University, the University of Notre Dame, and St Vladimir’s Orthodox Theological Seminary. He holds a Doctorate in Theology from St. Patrick’s College, Maynooth. Joseph A. Jungmann, The Mass of the Roman Rite: Its Origins and Development (Missarum Sollemnia). Francis A. Brunner, trans. (New York: Benziger, 1951), 2:361-362. For a general historical treatment of the subject see Joseph Nicholas Stadler, Frequent Holy Communion: A Historical Synopsis and a Commentary, Canon Law Studies 263 (Washington DC: Catholic University of America Press, 1947). For a general historical account of the manner of receiving Communion in the Roman Rite see Jungmann, The Mass of the Roman Rite, 2:374-391. For a detailed account of the adoption of the practice see Annibale Bugnini, The Reform of the Liturgy 1948 – 1975. Matthew J. O’Connell, trans. (Collegeville, MI: Liturgical Press, 1990), 640-661. Linda Schaefer, Come and See: A Photojournalist’s Journey into the World of Mother Teresa (Stanford, FL: DC Press, 2003), 135. The photograph is reproduced with Linda Schaefer’s permission. St. Cyril of Jerusalem, Mystagogical Catechesis 5.21 in Maxwell E. Johnson, trans. and ed., Lectures on the Christian Sacraments: The Procatechesis and the Five Mystagogical Catecheses Ascribed to St. Cyril of Jerusalem (Crestwood, NY: St Vladimir’s Seminary Press, 2017), 135. Thank you for your work and for this clarification. The truth will set us free! The love and humility of Jesus still scandalizes many people. Repent and believe in the Gospel! It’s amazing to me that articles like this never acknowledge the most basic point of all: that once a development has occurred in the liturgy and become universal, suddenly switching back to a purportedly “more ancient practice” has a totally different context and meaning than that original practice had. Is this really not evident to all? In the East, Christians always stood up for communion (although it’s been a very long time since a Byzantine layman has received otherwise than in the mouth). But in the West, for a millennium, laymen knelt and received on the tongue. When people were suddenly instructed/invited to walk up, stand, stick out their hands, and receive the wafer, it sent a message as thunderous as Luther’s or Calvin’s. Yes, all that. This is what the Church authorities – the pope and the world’s bishops – approved. I’m saddened at your ongoing campaign against them. Father, would you say that folks like Peter, people who did not have the experience of the pre-council church, have a romanticized view of the church. But only consider those things from the tradition to be “traditional”. I am always amazed that Peter will make a comment and challenge things, which of course is fine as we always need to be challenged for our own good, but when he is challenged will never respond, especially to you. Thank you for Pray Tell and all the work you and os many other do. FWIW, I’ve generally taken Peter K’s interventions here as a way to publish ideas adapted from what amounts to an ever-growing series of position papers: the intention is just about presentation of an alternative viewpoint, not conversation as such. Acknowledging that personal anecdote is not data, I remember the first time I received the Most Blessed Sacrament in the hand when I was in high school, it was nothing like a thunder such as Luther’s or Calvin’s. Now, at a 40-year remove, I can see that whatever posture becomes default can more readily become rote. This was true when we lined up and moved forward to kneel at the rail while the priests and servers quickly administered Holy Communion like rows on a corn cob, as it is today in places where the speed is clearly the summum bonum of administering Holy Communion in processional line. Intentionally gathered communities that have chosen a particular liturgical praxis seem to have some greater insulation against default roteness, but with the cost of increased risk of strife over differences in details. Peter, yes I agree with you. Liturgical renewal is not simply an archaeological recreation. It has to be more than that. Some radical changes in liturgical practice (including Communion in the hand) were introduced after Vatican II. But these were done in order to allow people to better live their faith. The details of this can (and indeed should) be argued in a million ways and details. Christianity is facing many serious challenges today and there must be serious debate in the Church about liturgical practice. But now we are in an analogous situation, I am 46 years old and since my First Communion have been receiving Communion in the hand. This new/”switched back” practice has now become a “universal” “development.” Today millions of practicing Catholics could not imagine returning to Communion on the Tongue while kneeling at the altar rail (even though this form of reception has not been abolished). I believe that we can we talk about the merits of one form of reception of the Eucharist over another (which is why I am hoping that the book Cardinal Sarah is a serious contribution to the debate). However, branding a now universally adopted liturgical practice whereby millions of Catholics receive Communion in a particular way as being “Satanic” is not the best way to encourage dialogue and common reflection. Correction to my last post. The book I am hoping will be a serious contribution to the debate is the actual book for which Cardinal Sarah wrote his now famous preface: Federico Bortoli, La distribuzione della Comunione sulla mano: Profili storici, giuridici e pastorali (Siena: Edizioni Cantagalli, 2018) ISBN: 9788868795481 pp 352. I just wanted to menton what would you do if Jesus actually appeared in front of you would you stand or kneel before him. I think I see what you’re getting at, but this is not the most helpful way to look at the question. I believe in the Real Presence. But I’m aware that this is, in Catholic teaching, not the same presence as when Jesus walked this earth. The Church is clear that this is a sacramental presence. Thomas Aquinas, the “father of transubstantiation,” explained that we cannot see the Body of Christ with our eyes at Mass the way the apostles saw Jesus. Aquinas taught that we can only see the Body of Christ in our minds/hearts, not with our eyes. I suppose there is something good hidden in the over-emphasis on reverence to Jesus in Communion, but it is interesting that some who are anxious about greater reverence aren’t quite following Church teaching. That is problematic. The Eucharist is a mystery beyond all our comprehension. Let’s support each other, love each other, and not use Eucharist as a cause for division, as we all gradually immerse ourselves in ever more of this mystery. I am not sure what I would do because I am not sure I’d be thinking that it was about doing something and I would instead trust God to take the lead in whatever way God chose for my good and then for me to respond accordingly. But I could of course be wrong about that surmise. It appears one reason why this topic garners much commentary is because the way it’s typically framed makes it easy to treat as if it were a complete discussion. Much like how an evaluation or critique of the design of a new church is ordinarily almost entirely about the visual aesthetics (and how well they harmonize with our faith) – while neglecting the equally important aural and experiential aesthetics, because those other dimensions are not as easy to discuss. I don’t view reception of Holy Communion in the hand as a hill-to-die-on for the conciliar reform. Not even close. But Cardinal Sarah’s unfortunate rhetorical choices don’t warm me to his perspective, and I don’t think they were intended to warm them that didn’t already agree with him. As traditionalists often feel this way about rhetoric point about them or their practices. And my point here being not one of equivalence or mere empathy – but of an opportunity for solidarity (a grittier thing than mere empathy in my book) as fellow disciples and members of the same Most Sacred Body. I would give him a hug and expect one in return. We have known each other a long time. This irenic and well-sourced piece is a fine contribution. I think this should balance and dispel some of the misconceptions that Cardinal Sarah’s unfortunate treatment of the subject has brought into the public eye. Thank you, Neil, for helping us to see the example of Mother Teresa and Pope John Paul II in context. Weighing in on this I will say that at 67 years of age, I have done both. I liked both, and if I were at a church where they had a communion rail, I would use it. If at a church where distribution was in the hand I am more than happy with that also. I think everyone understands that reception in either form should be respectful of the real presence. The problems that I observe is when one’s personal opinion of how communion is to be received conflicts with the local practice. The difference between receiving on the tongue today – whether standing or kneeling – from when I was an altar server is that I had a paten under the chin of every person and if there was a slip – usually at least one per Mass – there was little to no chance of the host hitting the floor; it had been planned for ahead of time. That isn’t true in most churches in the US these days. It gets a little compounded when someone proceeds to communion with others receiving in the hand and drops to their knees and sticks out their tongue, and the priest has to actually squat to make a safe distribution. Sometimes he even has to help the person up. So, that person got their personal experience somewhat at the expense of the other communicant’s experience. Try to make it about the Eucharist and not so much you. Certainly if you observe communion in many parishes there are people receiving in the hand who do not appear to be aware of the importance but I have no clue as to what they are really thinking in their hearts and I choose not to judge. I will also say that as an altar server I observed many kneeling who also seemed detached from the experience; I was younger then and probably did judge. I do not think either is inherently more respectful than the other except for one’s personal belief. I put “purportedly” and “totally” in brackets because I read them as polemical noise words, rather than as genuine contributions to the discussion. I can’t understand how anyone could go about establishing — rather than simply asserting — that the context and meaning of a restored ancient practice was totally different. But if the more reasonable claim is that the context and meaning are different — of course. How could it be otherwise? Who here has claimed that the context and meaning of communion in the hand today was identical or even largely identical to this practice the first two centuries of the Church’s life? A more productive question might: where and how are they different? Cardinal Sarah’s words bothered me for other reasons. He uses the imagery of the leader of the heavenly hosts, the great Archangel Michael battling Satan, to justify adopting a humiliated posture, becoming like an infant having food put in his mouth. I am sure the oppositions could be done to good effect, but it just looks like a mixed metaphor. If Satan laughs, I am sure he would laugh at this portrayal of St Michael’s fighting forces as helpless infants! I was taught that standing means something. Resurrection is to stand again in Greek, and Christianity is so we can stand with Christ. Before Communion, we say the words of a military commander expressing his humility, but he continues saying “For I myself am a man under authority, with soldiers under me. I tell this one, ‘Go,’ and he goes; and that one, ‘Come,’ and he comes. I say to my servant, ‘Do this,’ and he does it.” That is the effect of Communion, that we stand again with Christ, under his authority and with authority to go and love and serve the Lord. That is a different kind of humility from what Cardinal Sarah proposes. Jim, standing does mean something, but kneeling has a long history in both the eastern and west churches, distinct from standing, as a symbol of humility and piety before God, especially in the Eucharist. The GIRM even mandates kneeling at least during Eucharistic Prayer, and asks that churches be built with kneelers if possible to facilitate this (though some newer churches conveniently disregard this rule). One reason for this is that encounter with the Eucharist is intended to be a moment of individual conversion to Christ in our mortal state, even if done in common as at mass or in public Adoration. Though standing as a sign of respect for people of authority has much historical and cultural precedent, even in the Church, God isn’t like any other person of authority, which is why this special decorum exists for Him. Lest we forget the words we say at mass before receiving, “Lord, I am not worthy that you should enter under my roof…” None of this is to say you don’t have a good point on literary standing with Christ at mass, but that kneeling as a sign of piety and humility is an indispensable part our Eucharistic worship, as we are mere mortals before an all powerful God. Actually the universal GIRM advocates kneeling for the Institution Narrative of the Eucharistic Prayer. The U.S. GIRM (approved by Rome) advocates kneeling after the Sanctus for the entire rest of the Eucharistic Prayer. In my experience, this common U.S. practice is not common in Europe. The U.S. GIRM also gives the posture for reception in the U.S. as standing. The universal church prohibited any kneeling whatsoever at Sunday Eucharist any Sunday of the year, and every day of Easter season, at the Council of Nicea in 325. This gradually fell into disuses in the West but is widely observed in the East to this day. Eastern churches generally don’t have kneelers and people don’t kneel for the Eucharistic Prayer or reception. Patrick, I understand that kneeling means something. I just had not heard anyone articulate what standing means. I felt it needed to be added to the discussion, especially since Cardinal Sarah had introduced a “military” meaning by talking about Michael at war with Satan. The moment of Communion is meant to be a moment of conversion to being one with Christ, to becoming the Body of Christ. We do not need to be obsessed with our weakness; it is better to live the Divine Life shared with us in the Eucharist, to stand with Christ who stands again for us. Please reread what I wrote. “Lord I am not worthy…” is a quote from Matthew 8:5-13. There it continues “for I myself am a man under authority, with soldiers under me.” We take it out of context, particularly by changing “servant” to “soul,” but the humility meant by those words is not that of a helpless child, but of a centurion of great faith. Perhaps the irreverence everyone seems to see is because they don’t recognize how differently humility can appear? Perhaps, without getting bogged down in semantics I’ll posit that the debate over kneeling and standing during the Liturgy of the Eucharist may boil down to different framing approaches to the Holy Sacrifice: standing being an expression of committed faith (as you point out), kneeling being an expression of humility and abandonment, though these aren’t mutually exclusive. I come from the U.S. where the latter practice is the norm as laid out in our edition of the GIRM (thank you Fr. Ruff for correcting me here), so I might suffer from a America-centric viewpoint on this. I know in much of Europe (namely France and Spain) individual seats w/o kneelers has long been the norm for whatever reason, but I won’t be the one to claim they’ve been doing it all wrong for centuries. When Pope John Paul 11 celebrated an outdoor mass at Monterey (Laguna Seca), California in 1987, I was the first to receive communion from him (on the hand) and then I led him (with his MC, the now Archbishop Pietro Marini) down the long ramp to the place where he would give communion to about 100 people, many to whom he gave it in the hand. While I was standing next to him during all this time he did not appear to be in any way upset about giving communion to the people in their hands. It was a most joyful celebration for all present. Thank you for this important contribution regarding the reception of Holy communion. And for the interesting comments. I have been doing so much research regarding communion in the hand vs tounge, and there seems to be a better argument for the latter amongst so called ” conservative Catholics”. Recently I’ve been leaning more and more towards the old practice even though I’ve walys been taught to receive communion in the hand ( a practice I have done all my life#NCWAY). AND I’ve actually used that exact quote by mother terresa and john Paul II!!!!! Sorry, but there is a wide diversity of practice on this in the Eastern Churches, both Orthodox and Catholic. Many Eastern Catholics still kneel, moreso because they have had to ape their Roman brethren in order to be accepted as real Catholics, but most do not during the Paschal season. Many Orthodox will kneel on Sundays, especially at the epiclesis. Just because there are no kneelers doesn’t mean they won’t kneel. Thanks for this helpful information. I know very little about things Eastern and had the misimpression that it was widespread but not universal. I appreciate this correction. Anyone who wises to receive Communion on the tongue may do so. Anyone who wishes to receive Communion in the hand may do so. I frequently hear of those who choose to receive Communion on the tongue insist that those who choose to receive it in the hand not be allowed to do so, yet I have never encountered anyone who choose to receive Communion in the hand insist that people should not be allowed to receive it on the tongue. If people wish to receive Communion on the tongue they are allowed to. Why all this insistence and obsession that other people MUST do it their way? I have to confess this continuing discussion, while likely necessary in some quarters, is deeply tiring and a distraction from the real issues of liturgy and the Church’s mission. It belies a focus not on reverence, but a policing of what others do. We’ve always had that. Pharisees fussing about picking wheat in fields. Married persons wringing hands over whether a remarried person has annulment papers. Non-believers and fence-sitters look at it and cluck and who can blame them? Reverence is rooted in an interior orientation to God. Not something that’s done for show. And there is plenty of fussing, hand-wringing, and policing going on from thoroughly reformed post-Vatican II quarters too. Putting aside the equivalence/false equivalence dimension of this, in my many years in the groves of progressive communities, I came to realize how much rubrical itchiness was just another form of rubricism (but harder to see because it was Well Intentioned – and I don’t mean that in a cynical way, as I do think much of it was sincerely well-intentioned, though sometimes, especially with Lone Ranger celebrants or liturgists, it was thinly masked (if masked at all) clericalism or its lay cognates). This Is How We Do Things Here wasn’t nearly as free from small rules as was imagined; rather, it could often be even more mired in them. And it was rarely rooted in a deep and broad consensus of the communities on whose behalf these practices were adopted – at least not nearly as much as was assumed. Which is why I tend to focus on identifying and questioning unspoken assumptions, and asking about evidence. If so, perhaps they are not as thoroughly reformed as they seem. I can only hope to remain an equal-opportunity critic in such cases. May I point out that St Cyril’s words, which I agree are beautiful, do not describe the current majority practice, but rather reception into the palm of the right hand, and by implication bowing the head to take the Sacrament directly from there into the mouth. This is a practice which I first learnt in the Church of England and have continued since becoming a Catholic as it seems to me eminently reverent. What I have not been able to continue however and very much miss is kneeling alongside others at the altar rail. This loss of the communal dimension simply doesn’t make sense to me. I’m sorry but you are not in any position to know what is in the hearts of those who choose to receive Communion in the hand. Actions speak louder than words. One’s actions are evidence of the contents of one’s heart. This sure sounds like being proud of ones humility – and judging others who are not as humble. We know what humility looks like – it is a man who denies himself and his desires to suffer and die on a cross for us sinners who even lack the humility required to kneel and receive his sacred body on the tongue, but rather receive on the hand neglecting all the fragments of His Holy body that fall carelessly to the floor to be trodden under foot. As for judging others – I leave that to the Lord. But you just judged everybody — in your statement. Beneath all of these comments, is a consensus: Jesus is Lord and is with His Church, nourishing Her with His own Body and Blood. We should take a moment to give thanks to the Holy Spirit in bringing us all to this Faith, and for kindling in each one of us here the burning desire that this Faith be expressed as clearly as possible in the Church’s public worship. Mother Teresa lamented the lack of profound respect and reverence for the Eucharist as evidenced by so many people receiving In the hand. The acceptance of hospitality is an important consideration. I prefer to receive on the tongue, but I have attended churches where almost no one does so. In these churches I receive in the hand. I do so because this is the custom of the “house” and its “residents”. Would one attend a dinner and loudly deride this meal which someone has laboriously prepared? No, one would eat the meal and reserve her judgment. Similarly Mass has been prepared in these churches with care and forethought. My response, if only a polite response, is to respond to the Mass in the same manner of those who frequent liturgies there often. IF you finish the quote St. Cyril also says to touch the Holy Body of Christ to their eyes before consuming it. Then the faithful should touch their lips still moist with the Precious Blood of Christ and touch the Blood to the eyes.